Mostly, wooden chess pieces are handmade and carved. Its form and shapes only done with hand-working. Chess pieces are consist of 32 pieces in black and brown color. 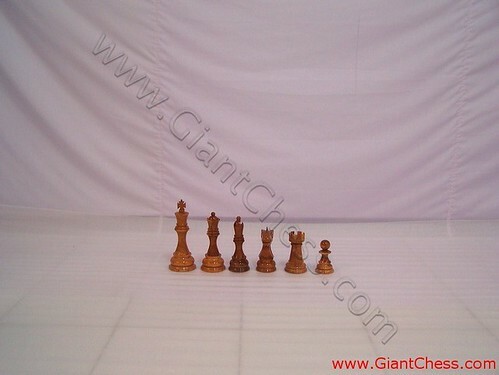 The picture above is one of our chess pieces product that polished in brown. Those pieces are carved by expert craftsman, so that its design so beautiful an artistic. Wooden chess pieces has made of best quality of Teak wood and polished in brown or natural wood color. So unique kind of chess pieces because those are handmade product. Chess lovers like to collect this kind of handmade product for their interesting game. Besides, we also provide in big size, so that you can use them as house decoration. It perfect for decor your living room, office, library table and other corner in your house. Give some different touch for your house by using those big wooden chess pieces.